My books cover a wide variety of recipes, however I also offer some on my website for free. "Traditional Indian Cuisine with a Brilliant Modern Twist"
Mridula’s range of chutneys is made with love and passion. She has been lovingly re-creating some stunning chutneys based on the memory of her mother’s kitchen back in Assam in the hilly North-East India. 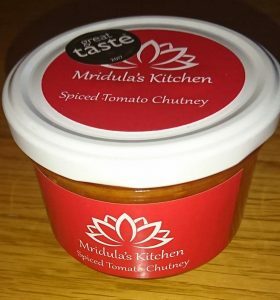 This award-winning tomato chutney is the first of many to be sold from her website. If you would like to order then please click here to get in touch. Mridula will be really happy if you leave your feedback. Thank you. When you sign up to my mailing list you will receive regular updates including new recipes before they are posted on the website, cookery techniques and information on any courses or special offers which are available.